✔ Convenient view of all your Contacts in one location. ✔ Easily search contacts by Contact Type. ✔ Quickly sort contacts by First Name, Last Name, Company or Primary E-Mail Address. ✔ Simple one-click access to view/edit each Contact's Details. ✔ Create unlimited Contacts with ease! ✔ Have multiple Contacts at one company? Use the "Copy Contact" feature to quickly get them all into your PerformerTrack account! ✔ Easily export your Contacts by Type and by targeted lists so you can print labels, mail merge, create e-mail lists, etc. 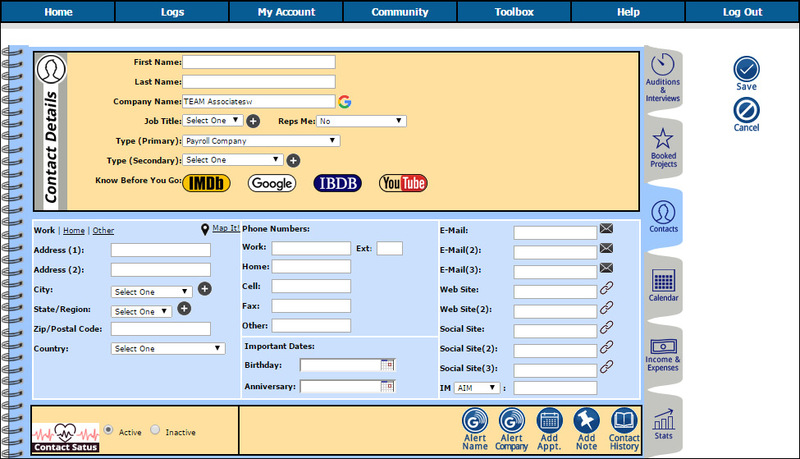 ✔ Use the built-in search links for IMDb, Google, IBDb (Internet Broadway Database) & YouTube to research your Contacts. ✔ Store up to three addresses per Contact; "Home", "Work" and "Other". ✔ Quick-link to Google Maps for Contact addresses (Driving Directions, Walking Directions, Subway Directions, etc.). ✔ Store multiple E-Mail Addresses, Web Sites, Social Sites and more! ✔ Birthday & Anniversary Dates are automatically entered into the Calendar Section to remind you every year when those dates are approaching! ✔ The "Add Notes" area allows you to enter UNLIMITED Notes for the Contact. ✔ Add UNLIMITED Appointments which are auto-linked to the "Contact History" and are immediately scheduled to the Calendar Section. ✔ "Contact History" reveals every Note, every interaction (such as in Auditions, Bookings, Cast & Crew, etc.) as well as general appointments (i.e. - phone calls, submissions, follow-ups, e-mails, etc.) you have logged with the Contact.